ThoughtOffice Corporation, the makers of the eponymous creativity and brainstorming software, ThoughtOffice, has announced a partnership with Writers SuperCenter. The joint venture was developed to provide creative writing software to customers of Writers SuperCenter, and to help provide additional input and direction to ThoughtOffice’s next generation offering. This new partnership adds to the already impressive lineup of software for writers offered by Writers SuperCenter. 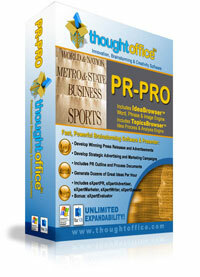 ThoughtOffice, the successor program to the legendary IdeaFisher brainstorming software, was originally developed to assist communications professionals, by allowing them to expand their thought processes both laterally and in depth. Similarly, Writers SuperCenter was founded specifically to support writers world-wide with the best software available, from a host of vendors. Irwin Berent of Writers SuperCenter originally contacted ThoughtOffice with the idea of carrying ThoughtOffice’s creative writing software on his site. The software company eagerly jumped at the chance to work with such a well-regarded online retailer as Writers SuperCenter. It’s turned out to be a great match. Writers SuperCenter is known to writers the world around, and ThoughtOffice software is increasingly becoming the “secret weapon” of choice for writers who really want to expand their creativity. Unlike any other store on the Internet, the Writers SuperCenter is the only store that buys writer’s software on a massive scale, offering its customers the lowest possible prices. All products are the most up-to-date versions, fully warranted by their manufacturers, and supported by the company’s 24 x 7 tech support staff. Writers SuperCenter is a family-owned enterprise, located in Norfolk, VA. Since 1996, the company has been offering the best software for writers through its online store at http://www.writersupercenter.com/ For more information, contact the Writers SuperCenter via their web site, or by phone at 1-800-589-1022. ThoughtOffice, based in Vancouver, WA, develops and markets tools that empower individuals and organizations to create valuable ideas and improve productivity by enhancing innovation. Founded in 1998, the company produces writing, brainstorming and creativity software, and its sister company, RichContent, provides PR & business services to technology startups and fast-growth companies. The WebNutrients division approaches innovation and creativity via “WetWare” – thought-enhancing nutritional supplements. The company’s web site can be found at http://www.ThoughtRod.com. ThoughtOffice can be reached by phone at 360-450-6888 or e-mail to info@thoughtoffice.com.